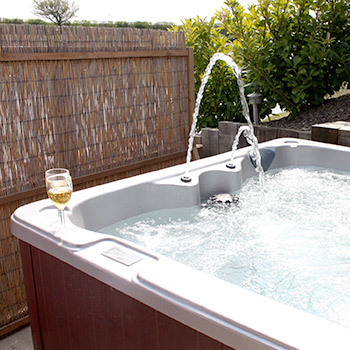 Hot tubs are the perfect way to relax and unwind on holiday after a day’s walking in the Suffolk countryside and they are also well known for their hydrotherapy benefits. It has been said that spending 30 minutes a day in a hot tub will make you feel healthier and live longer, so make the most of the hot tubs at our self-catering lodges. That fits well with the motto here at The Suffolk Escape of “Stop, Relax & Unwind” as that is what most people tend to do when they come to our quiet adults only site! Each of our four self-catering log cabins has its own private hot tub which is set on a patio to the side of the lodges overlooking the lake. 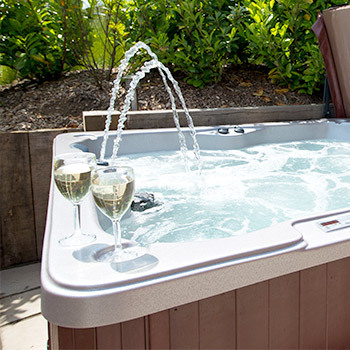 The hot tubs have a powerful pump, offering pure hydrotherapy through 42 water portals. The seating arrangement has been carefully thought out so each individual have their own uncrowded space from head to toe. Jet types and placement are carefully considered to give each seat its own unique “feel” and range of massage sensations. The manufactures expect people to move around in our hot tubs, sampling each seat and savouring the different flavours of massage from neck and shoulders, to back and thighs, calves, ankles and feet. Our hot tubs are just outside the lodges and they come alive at night with the LED lighting. We selected our hot tubs as they operate a unique chemical treatment system which uses up to 80% less chemicals compared to normal spas which is better for our holiday guests and the environment. To see our log cabins and their hot tub positions please visit our Hot Tub You Tube Video and you will get a really good idea of how they are set-up. 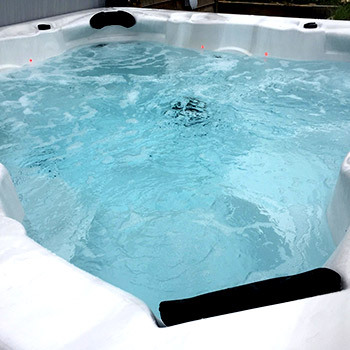 Hot Tubs deliver hydrotherapy benefits through a mixture of heat, buoyancy and massage to relieve stresses and strains from everyday living – tiredness, headaches and muscular tension. Studies have shown that health benefits can go much deeper than improvement in mood, productivity and mental health. Bathing in hot water combined with air and water massage causes blood vessels to dilate, improving circulation, cardiac output and purification of toxins in the body. Warm water massage stimulates the body to release endorphins that reduce stress naturally. In addition to stress reduction, a Hot Tub’s hydrotherapy jets also dilate blood vessels to help prevent headaches. Falling asleep faster and getting a good night’s sleep is also greatly aided by soaking in a Hot Tub. Hydrotherapy has always been a treatment endorsed by athletes, relaxing and increasing blood circulation and blood flow to injured joints or muscles to speed up recovery and repair.